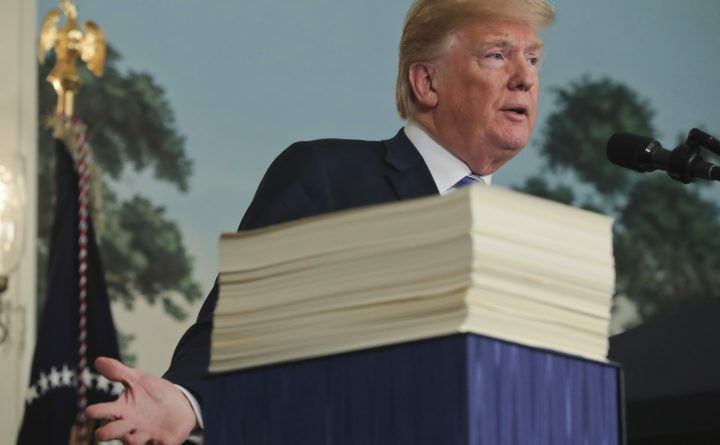 President Donald Trump speaks in the Diplomatic Room of the White House in Washington, Friday, March 23, 2018, about the $1.3 trillion spending bill, which is sitting on a table beside him. 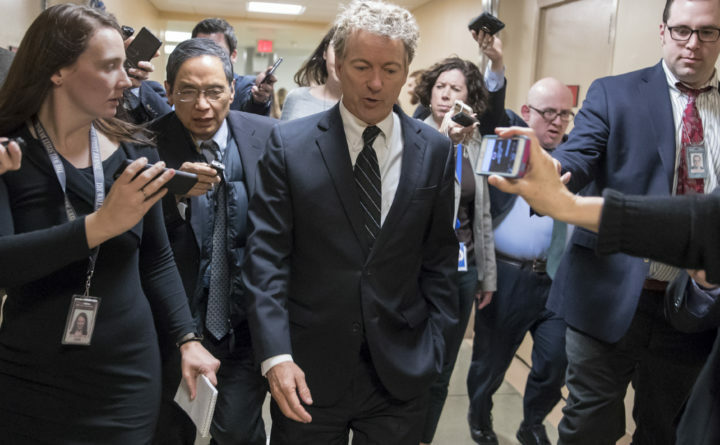 In this March 21, 2018, photo, Sen. Rand Paul, R-Kentucky, walks to the Senate floor for a vote with accompanying reporters, on Capitol Hill in Washington. As the Senate gets closer to another government funding deadline, Paul is protesting the pending $1.3 trillion spending bill, which he has called "budget-busting." Just hours after threatening a veto, President Donald Trump said Friday afternoon that he had signed the sweeping $1.3 trillion spending bill passed by Congress early Friday and averted a government shutdown. In a morning tweet, Trump said he might veto the omnibus bill because it does nothing to address the fate of those protected from deportation by the Obama-era Deferred Action for Childhood Arrivals (DACA) program and does not fully fund his border wall. But speaking to reporters at the White House less than four hours later, Trump said he had decided to sign the bill despite his reservations, arguing that it provides much-needed funding for the military, including a pay increase for troops and new equipment. “I say to Congress, I will never sign another bill like this again,” Trump said, also calling on Congress to give him a line-item veto. In his Friday morning tweet, Trump said that those protected from deportation by the DACA program have been “totally abandoned” by Congress, and he blamed the Democrats. Trump, who sought to cancel DACA last fall, was seeking a deal that would give Democrats protections they sought for the program’s recipients in exchange for additional funding of $25 billion for his long-promised U.S.-Mexico border wall. The bill includes a minor down payment of $1.6 billion on his marquee campaign promise. “Let’s not forget that you ended DACA and torpedoed every possible bipartisan fix. This is on you,” Rep. Tim Ryan, D-Ohio, said on Twitter. Instead, in his veto threat Friday, Trump proposed something that conservative hard-liners have largely rejected in recent months – trading DACA protections for border wall money. Conservatives, emboldened by a White House proposal released in January, have insisted that any immigration deal go farther, cutting several programs that allow foreign nationals to live in the U.S. legally. On Wednesday, House Speaker Paul Ryan, R-Wisconsin, rushed to the White House to reassure Trump. The president was upset with the amount of money for his border wall, and he griped about a proposed tunnel between New York and New Jersey – a project beloved by Senate Minority Leader Charles E. Schumer, D-New York – that Trump has ferociously tried to block as part of the negotiations. The Post’s Josh Dawsey, Erica Werner, Sean Sullivan and Seung Min Kim contributed to this report.